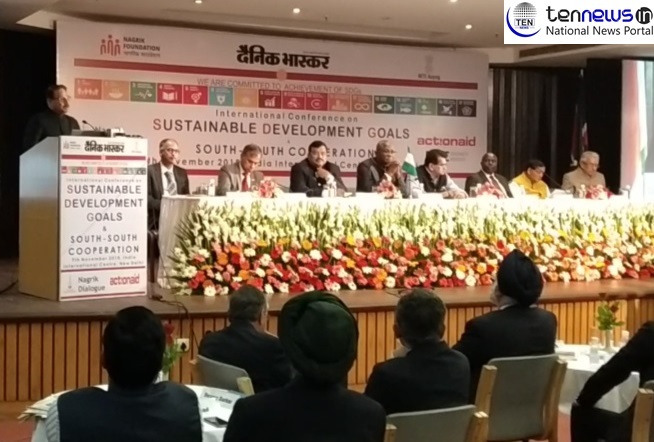 New Delhi : The International Conference organised by Dainik Bhaskar on “Leaving No One Behind, Sustainable Development Goals and South-South Cooperation” was organized at the India International Center. On this occasion, Dainik Bhaskar Chairman and Editor-in-Chief Deepak Dwivedi welcomed dignitaries and shared details of the subject. The event was graced by a large number of dignitaries. Esteemed guests shared their vision on the key topic. Amitabh Kant, CEO of the Policy Commission, India’s Representative Executive Board of UNESCO and Padmashree Awardee Professor JS Rajput, Kenya’s High Commissioner to India Willy K Bett, MP Dr. K. Ranjan Mishra of Kenya’s Constituency, Siddharth Chatterjee of U.N. R. Nairobi, DOC Research Institute Sector managing project director and founding CEO Puran C. Pandey, former Secretary of the Department of Education Anil Swarup, Sulabh International and Padma Bhushan Awarde Dr. Bindeshwar Pathak were also present on the occasion. At this occasion, the dignitaries also came together to release the book “Leaving No one Behind, Sustainable Development Goals and South South Cooperation Focused on Sustainable Development Goals”. The latest issue of Citizen Dialogue magazine was also released. Apart from this, the annual calendar of the year 2019 of Dainik Bhaskar Publications Group was also being released by the hands of dignitaries. Former secretary of the education department of the Government of India, Anil Swarup, Nigerian High Commissioner to India Chris Sunday Ize, former Ambassador of India to Germany, Gurjeet Singh, former Ashok Sajjanhar, former Ambassador of India to Kazakhstan and Latvia, founder of Sulabh International Dr. Bindeshwar Pathak, recipient of Padma Bhushan Awards, representative of the Executive Board of UNESCO from India and Padmashree awardee Professor JS Rajput addressed the gathering and kept their own vivid ideas on this subject. P C Pandey, Director of Dainik Bhaskar addressed the audience with beautiful words related to the dignitaries present at the moment. Respecting all the awardees that were present on the dice, PC Pandey delivered a speech aiming at the success of Sustainable Growth cause.